This article was written by Twitter activist: homylafayette. We have published this article in full with their permission. Will he or won’t he? The question has been burning Iranian newswires since Saturday. Will Ali Akbar Hashemi Rafsanjani lead Tehran’s Friday Prayer on Ghods Day, September 18, which the opposition has marked in green in its calendar and hopes to make a repeat performance of the multi-million-man marches of the movement’s early days? Rafsanjani, head of two key constitutional bodies, the Assembly of Experts and the Expediency Council, has become a reluctant figurehead for the green movement which has propelled him to that position with equal wariness. Rafsanjani is a regular leader of Tehran’s Friday Prayer, appointed as preacher by Ayatollah Ruhollah Khomeini and thus not easily impeachable. The last time he spoke at Friday Prayer was July 17 and despite his characteristic tightrope speech in which he attempted to be all things to all men, protesters flooded into the breach. The prayer hall at Tehran University holds about 5,000 people and the adjacent streets and empty lots another 50,000. Video footage showed even more protesters, extending far beyond the usual perimeter of loudspeaker-equipped avenues. 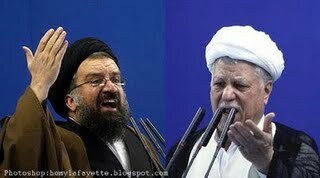 They chanted boisterously, their voices heard from outside the prayer hall, eagerly breaking taboos by responding to the official chant-master’s ‘Death to America, death to Britain’ with their own ‘Death to Russia, death to China!’ Rafsanjani interrupted his speech, calling plaintively on the demonstrators, ‘Please allow me. I’m saying it better than you would.’ (Full footage of his speech here, text of the speech in English, courtesy Council on Foreign Relations here). Protesters subsequently took to the streets in a peaceful manner. Rafsanjani usually preaches at the Tehran prayer once a month, but he was replaced on August 14 by Hojjatoleslam Ahmad Khatami (no relation to former reformist President Mohammad Khatami), temporary Tehran Friday Prayer leader and a hard-line supporter of Supreme Leader Ali Khamenei and Mahmoud Ahmadinejad. Reza Taghavi, head of the national coordinating body for Friday prayers, said at the time that Rafsanjani had relinquished his spot to ‘avoid any unacceptable political exploitation’ of the event. A month on, it is Rafsanjani’s turn once again. In recent years he has always preached on Ghods Day, an annual event created by Ayatollah Khomeini to protest Israel’s occupation of Palestine. But will he or won’t he? Shortly thereafter, Mehr news published an interview with Ahmad Khatami in which he denied he would be leading this week’s event. ‘The decision is made by the Supreme Leader’s office and this week’s prayer leader has yet to be determined,’ Khatami said. But then IRNA, the Islamic Republic’s News Agency, jumped into the fray and published an article in which Khatami denied his previous denial. ‘Despite what some sites have reported, I have not denied I will lead the prayers,’ Khatami said. The debate raged on the next day, Sunday. Sarmayeh newspaper’s front page headlined, ‘Rafsanjani: I have not renounced leading Friday’s prayer.’ The article went on to say that Rafsanjani’s office had issued a statement rejecting previous reports that he had decided against preaching this Friday. Jomhouri Eslami daily, close to Rafsanjani, also wrote that Rafsanjani had not abandoned the idea of leading the Ghods Day prayer. ‘Jomhouri Eslami’s reporter has reviewed the claims of certain sites and has ascertained that Ayatollah Rafsanjani’s office has not been contacted about [this subject] and that he has therefore not decided whether to preach or not,’ the newspaper said. On Monday, opposition news service Mowjeh Sabz took a stab at Fars news, saying the whole fiasco had been triggered by the ‘coup d’état’s news agency (Fars news)’ which had ‘published an old article from another news service and linked it to Ghods Day.’ Mowjeh Sabz added that Reza Taghavi had denied making any statement concerning Rafsanjani to Fars news and had demanded that the article be removed from the site. Several hours later, Tabnak news countered with a report of its own. ‘In an interview with Tabnak, Hojjatoleslam Massoud Moradi denied this news and declared that Ghods Day’s imam will be announced in a few hours,’ the site claimed. At 12:18 PM GMT, IRNA released another piece, this time citing an anonymous source who reiterated Moradi’s initial statement: Rafsanjani would not lead Ghods Day’s prayer. As of this report, the question has yet to be settled. For the protesters who aim to demonstrate in huge numbers on Friday, the answer may well turn out to be irrelevant.